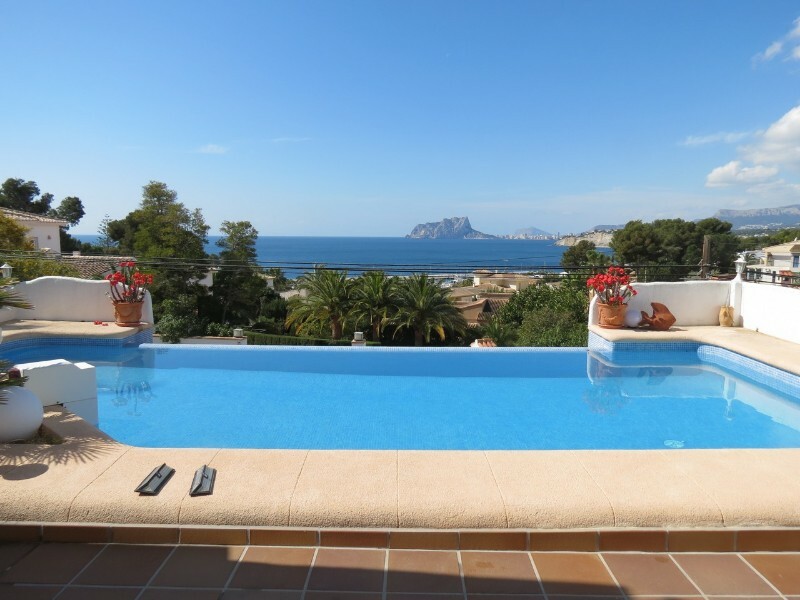 This, 2003 built, villa with panoramic open views, located in the Arnella area of Moraira, 2.6km to El Portet beach. This well maintained property has hot/cold air conditioning, electric heating, double glazed windows with mosquiteras in the bedrooms and shutters everywhere, satellite television, wi-fi internet, an alarm with video surveillance cameras and a heated pool. Perfect as a holiday home or for full time living.The property has parking for two cars at street level, more parking under the street parking and space for many more cars on the driveway.From the driveway you go down some steps to the principal level of the villa, you enter the villa through a balcony with a covered naya and into the living/dining room, this bright room has three windows all with amazing views, a feature fireplace with wood burner and off it a fully fitted open kitchen with raised breakfast bar. Next to the stairs you will find the house shower room, which includes the washing machine, and a bedroom with twin beds and built-in wardrobes. At the bottom of the stairs you will find the smallest bedroom, which still has space for twin beds. Along the hall there is the house bathroom with bath including shower and the spacious and bright master bedroom, which again has three windows with views and a built-in wardrobe. At the far end of the hall, through an archway with curtains,there is a new bedroom, a spacious room with glazed doors leading onto the pool terrace.The pool terrace has a built-in shower and plenty of space to soak up the sun and to enjoy the views. Down some steps through the easy maintenance garden terraces you reach a very private covered chill-out room, ideal for reading or meditating. The garden has many seating areas and many small terraces with mature Mediterranean plants. Outside the principal level there is a barbecue area and a small back garden where you will find a storage room. Up some steps next to the store you will find the magnificent roof terrace, from here you can enjoy sea views over Moraira and far reaching 270º views to the mountains.- Key points- 4 bedrooms- 2 bathrooms- Well maintained- Offered as seen- Heated pool- Alarm and security cameras- Excellent source of summer rental income- A property that should not be missed at this new price. 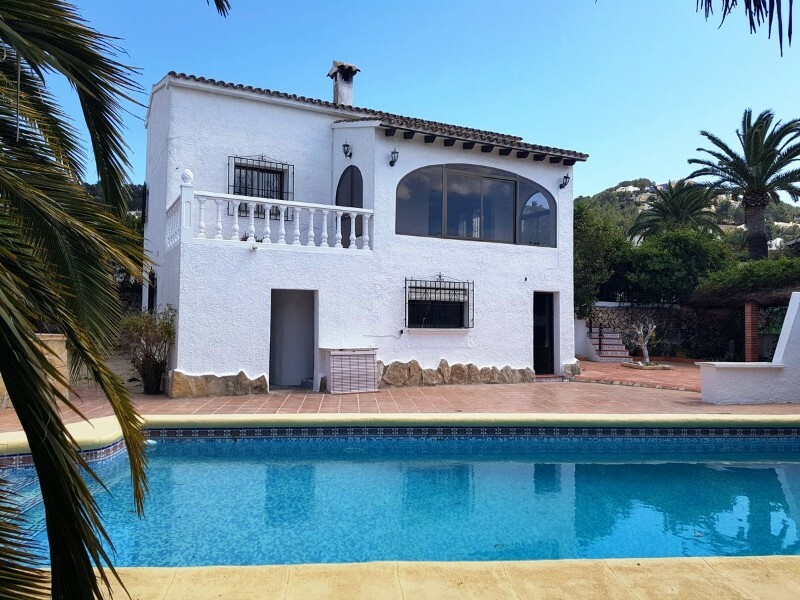 This is just one of the many Spanish properties that we have to offer on the Costa Blanca in the Alicante province. If you are looking for an apartment, townhouse, villa, new build villa, country house or a plot to build your own property, we have them all, and we also offer a property finder service to help you find the property that is perfect for you. If you cannot find what you are looking for on our website please contact us with your criteria and your budget and we will do our very best to assist you.